Located along Monte Vista Road between Third and Seventh streets, Phoenix, Arizona. 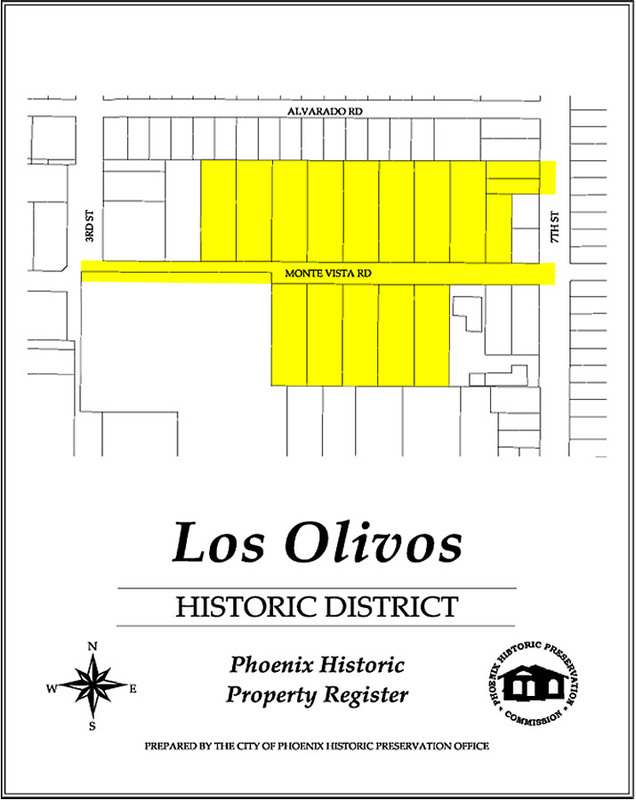 Deep landscaped lawns and large Revival Style and Craftsman custom homes make up the smallest historic district in phoenix—Los Olivos. Add the palm-lined streetscape (which is itself considered to be historic) to the 14 romantic homes on the 300 block of East Monte Vista, and you’ve got it! The original developers of Los Olivos Historic District aimed for quality construction, well-heeled buyers and stable property values. They hit the mark. You will probably find a grand living room, formal dining room, and detached garage on any one of these ¾ acre estates. You may find a wine cellar or tennis courts, library or guest quarters. And chances are good there will be a pool even though pools were not a standard feature in 1920s Phoenix. The average square footage of a Los Olivos home means little since each is custom built and unique, but that average—just for the record—is around 2800 square feet, typically with 4 or 5 bedrooms and a similar number of baths. If you like the custom mix of home styles, the ample living space and the lush landscaping here, you may also like the custom homes in the Alvarado, Encanto-Palmcroft and La Hacienda historic districts or in the Country Club Manor neighborhood. More history is available in the nomination to the National Historic Register.